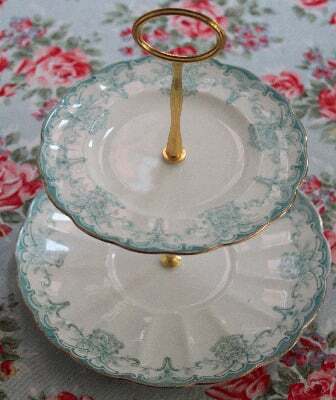 This is a beautiful two tier cake stand handmade from vintage Tuscan bone china plates. This china is very pretty and delicate and has a fluted edge to the plates. The plates are in excellent condition with no chips or cracks. All of our cake stands are fully collapsible and simply unscrew for easy storage. The top plate is 17.5 cm diameter and the bottom plate is 23 cm diameter.